A. Chan, B. Gilks, J. Kwon, and A. V. Tinker, “New Insights Into the Pathogenesis of Ovarian Carcinoma: Time to Rethink Ovarian Cancer Screening,” Obstet. Gynecol. 120(4), 935–940 (2012). R. S. Tuma, “Origin of Ovarian Cancer May Have Implications for Screening,” J. Natl. Cancer Inst. 102(1), 11–13 (2010). Brown P, Palmer C, “The Preclinical Natural History of Serous Ovarian Cancer: Defining the Target for Early Detection” PLOS, 6 (7) (2009). C. P. Crum, R. Drapkin, D. Kindelberger, F. Medeiros, A. Miron, and Y. Lee, “Lessons from BRCA: the tubal fimbria emerges as an origin for pelvic serous cancer,” Clin. Med. Res. 5(1), 35–44 (2007). C. P. Crum, “Intercepting pelvic cancer in the distal fallopian tube: theories and realities,” Mol. Oncol. 3(2), 165–170 (2009). N. Nishida, F. Murakami, and K. Higaki, “Detection of serous precursor lesions in resected fallopian tubes from patients with benign diseases and a relatively low risk for ovarian cancer,” Pathol. Int. 66(6), 337–342 (2016). S. S. Buys, E. Partridge, A. Black, C. C. Johnson, L. Lamerato, C. Isaacs, D. J. Reding, R. T. Greenlee, L. A. Yokochi, B. Kessel, E. D. Crawford, T. R. Church, G. L. Andriole, J. L. Weissfeld, M. N. Fouad, D. Chia, B. O’Brien, L. R. Ragard, J. D. Clapp, J. M. Rathmell, T. L. Riley, P. Hartge, P. F. Pinsky, C. S. Zhu, G. Izmirlian, B. S. Kramer, A. B. Miller, J. L. Xu, P. C. Prorok, J. K. Gohagan, C. D. Berg, and PLCO Project Team, “Effect of screening on ovarian cancer mortality: the Prostate, Lung, Colorectal and Ovarian (PLCO) Cancer Screening Randomized Controlled Trial,” JAMA 305(22), 2295–2303 (2011). S. Vaughan, J. I. Coward, R. C. Bast, A. Berchuck, J. S. Berek, J. D. Brenton, G. Coukos, C. C. Crum, R. Drapkin, D. Etemadmoghadam, M. Friedlander, H. Gabra, S. B. Kaye, C. J. Lord, E. Lengyel, D. A. Levine, I. A. McNeish, U. Menon, G. B. Mills, K. P. Nephew, A. M. Oza, A. K. Sood, E. A. Stronach, H. Walczak, D. D. Bowtell, and F. R. Balkwill, “Rethinking ovarian cancer: recommendations for improving outcomes,” Nat. Rev. Cancer 11(10), 719–725 (2011). M. A. Brewer, U. Utzinger, J. K. Barton, J. B. Hoying, N. D. Kirkpatrick, W. R. Brands, J. R. Davis, K. Hunt, S. J. Stevens, and A. F. Gmitro, “Imaging of the ovary,” Technol. Cancer Res. Treat. 3(6), 617–627 (2004). M. G. Radvany and R. S. Kiesz, “Plaque Excision in Management of Lower Extremity Peripheral Arterial Disease with the SilverHawk Atherectomy Catheter,” Semin. Intervent. Radiol. 25(1), 11–19 (2008). J. Kerin, E. Surrey, L. Daykhovsky, and W. S. Grundfest, “Development and application of a falloposcope for transvaginal endoscopy of the fallopian tube,” J. Laparoendosc. Surg. 1(1), 47–56 (1990). A. Y. Wong and S. M. Walker, “Falloposcopy--a prerequisite to the proper assessment of tubal infertility,” Hong Kong Med. J. 5(1), 76–81 (1999). D. K. Rex, “Maximizing Detection of Adenomas and Cancers During Colonoscopy,” Am. J. Gastroenterol. 101(12), 2866–2877 (2006). L. P. Hariri, G. T. Bonnema, K. Schmidt, A. M. Winkler, V. Korde, K. D. Hatch, J. R. Davis, M. A. Brewer, and J. K. Barton, “Laparoscopic optical coherence tomography imaging of human ovarian cancer,” Gynecol. Oncol. 114(2), 188–194 (2009). M. Kirillin, O. Panteleeva, E. Yunusova, E. Donchenko, and N. Shakhova, “Criteria for pathology recognition in optical coherence tomography of fallopian tubes,” J. Biomed. Opt. 17(8), 081413 (2012). T. H. Tate, B. Baggett, P. F. Rice, J. W. Koevary, G. V. Orsinger, A. C. Nymeyer, W. A. Welge, K. Saboda, D. J. Roe, K. D. Hatch, S. K. Chambers, U. Utzinger, and J. Barton, “Multispectral fluorescence imaging of human ovarian and fallopian tube tissue for early-stage cancer detection,” J. Biomed. Opt. 21(5), 056005 (2016). J. N. McAlpine, S. El Hallani, S. F. Lam, S. E. Kalloger, M. Luk, D. G. Huntsman, C. MacAulay, C. B. Gilks, D. M. Miller, and P. M. Lane, “Autofluorescence imaging can identify preinvasive or clinically occult lesions in fallopian tube epithelium: a promising step towards screening and early detection,” Gynecol. Oncol. 120(3), 385–392 (2011). T.-Y. Wu, A. R. Rouse, S. K. Chambers, K. D. Hatch, and A. F. Gmitro, “Confocal microlaparoscope for imaging the fallopian tube,” J. Biomed. Opt. 19(11), 116010 (2014). C. M. Lee, C. J. Engelbrecht, T. D. Soper, F. Helmchen, and E. J. Seibel, “Scanning fiber endoscopy with highly flexible, 1 mm catheterscopes for wide-field, full-color imaging,” J. Biophotonics 3(5-6), 385–407 (2010). E. J. Seibel, C. D. Melville, R. S. Johnston, Y. Gong, K. Agnew, S. Chiang, and E. M. Swisher, “In vivo laser-based imaging of the human fallopian tube for future cancer detection,” Proc. SPIE 9304, 93040 (2015). X. Li, C. Chudoba, T. Ko, C. Pitris, and J. G. Fujimoto, “Imaging needle for optical coherence tomography,” Opt. Lett. 25(20), 1520–1522 (2000). D. Lorenser, X. Yang, R. W. Kirk, B. C. Quirk, R. A. McLaughlin, and D. D. Sampson, “Ultrathin side-viewing needle probe for optical coherence tomography,” Opt. Lett. 36(19), 3894–3896 (2011). K. M. Joos and J.-H. Shen, “Miniature real-time intraoperative forward-imaging optical coherence tomography probe,” Biomed. Opt. Express 4(8), 1342–1350 (2013). B. Reimers, D. Nikas, E. Stabile, L. Favero, S. Saccà, A. Cremonesi, and P. Rubino, “Preliminary experience with optical coherence tomography imaging to evaluate carotid artery stents: safety, feasibility and techniques,” EuroIntervention 7(1), 98–105 (2011). D. Kang, R. V. Martinez, G. M. Whitesides, and G. J. Tearney, “Miniature grating for spectrally-encoded endoscopy,” Lab Chip 13(9), 1810–1816 (2013). J. Lee, Y. Chae, Y.-C. Ahn, and S. Moon, “Ultra-thin and flexible endoscopy probe for optical coherence tomography based on stepwise transitional core fiber,” Biomed. Opt. Express 6(5), 1782–1796 (2015). L. Scolaro, D. Lorenser, W.-J. 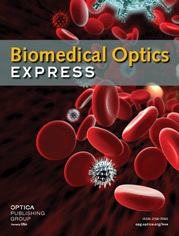 Madore, R. W. Kirk, A. S. Kramer, G. C. Yeoh, N. Godbout, D. D. Sampson, C. Boudoux, and R. A. McLaughlin, “Molecular imaging needles: dual-modality optical coherence tomography and fluorescence imaging of labeled antibodies deep in tissue,” Biomed. Opt. Express 6(5), 1767–1781 (2015). W. Göbel, J. N. D. Kerr, A. Nimmerjahn, and F. Helmchen, “Miniaturized two-photon microscope based on a flexible coherent fiber bundle and a gradient-index lens objective,” Opt. Lett. 29(21), 2521–2523 (2004). J. Mavadia, J. Xi, Y. Chen, and X. Li, “An all-fiber-optic endoscopy platform for simultaneous OCT and fluorescence imaging,” Biomed. Opt. Express 3(11), 2851–2859 (2012). Y. T. Pan, T. Q. Xie, C. W. Du, S. Bastacky, S. Meyers, and M. L. Zeidel, “Enhancing early bladder cancer detection with fluorescence-guided endoscopic optical coherence tomography,” Opt. Lett. 28(24), 2485–2487 (2003). J. Wu, M. Conry, C. Gu, F. Wang, Z. Yaqoob, and C. Yang, “Paired-angle-rotation scanning optical coherence tomography forward-imaging probe,” Opt. Lett. 31(9), 1265–1267 (2006). E. Lorenzen, F. Follmann, G. Jungersen, and J. S. Agerholm, “A review of the human vs. porcine female genital tract and associated immune system in the perspective of using minipigs as a model of human genital Chlamydia infection,” Vet. Res. (Faisalabad) 46(1), 116 (2015). A. M. Winkler, P. F. S. Rice, R. A. Drezek, and J. K. Barton, “Quantitative tool for rapid disease mapping using optical coherence tomography images of azoxymethane-treated mouse colon,” J. Biomed. Opt. 15(4), 041512 (2010). R. A. McLaughlin, D. Lorenser, and D. D. Sampson, Handbook of Coherent-Domain Optical Methods (Springer Science + Business Media, 2013). J. F. Black, T. Tate, M. Keenan, E. Swan, U. Utzinger, and J. Barton, “A six-color four-laser mobile platform for multi-spectral fluorescence imaging endoscopy,” Proc. SPIE 9304, 93040 (2015). M. Keenan, C. Howard, T. Tate, I. McGuiness, A. Sauer-Budge, J. Black, U. Utzinger, and J. K. Barton, “Design of an everting balloon to deploy a microendoscope to the fallopian tubes,” Proc. SPIE 9689, 96890 (2016). » Visualization 1: MP4 (10715 KB) Testing the falloposcope in a female reproductive tract model. View from the bronchoscope’s camera of the falloposcope entering the ostium. Fig. 1 System overview (top) and distal tip overview (bottom left) showing detailed inner components and the orientation in the sheath. The illumination fiber is shown in red (top) and in gold (bottom left), the OCT fiber in orange, and the fiber bundle in black. In this iteration, we use a single 638nm fiber coupled laser for illumination and image the proximal fiber bundle face onto a PIXIS camera. The OCT probe is incorporated as the sample arm into an existing tabletop OCT system. The distal tip uses a ferrule (grey) to hold the components (fiber bundle, GRIN lens, two pull wires, illumination fiber and OCT fiber). These inner components are within the outer sheath of heat shrink (clear tip) and polymer (purple). Photos of the probe are shown (bottom right) with the heat shrink peeled back (top) to reveal the optics and with the heath shrink and outer sheath in place (bottom). Scale bas are 0.5 mm. Fig. 2 (Left) Angle polished all-fiber OCT probe with the GRIN fiber segment outlined by its splice marks. The scale bar is 125 μm. (Right) Image of a roll of cellophane tape taken with this probe. The 2.5 mm wide image was collected in a motorized linear pullback collecting 4,000 A-scans/s. Fig. 3 Characterization of tapered illumination fiber. Image of tapered illumination fiber (left) taken with a microscope. Example output beam (right) of the illumination fiber once incorporated into the falloposcope. The beam is shown on a USAF bar target for contrast. The scale bar is 1 mm. Fig. 4 This figure shows images from the wide field imaging system. A) Image of Group 2 on the USAF resolution target. B) Image taken with the falloposcope of rhodamine fluorescence illuminated by 513 nm excitation and collected through 590 nm narrow band emission filter. C) White light photo showing the target of B. The 1 cm diameter cuvette is filled with rhodamine solution illuminated with 513 nm light. The white circle denotes the field of view of image B. Fig. 5 Overview of the falloposcope prototype. The red handle (left) was 3D printed in PLA to help assess ergonomics while showing proof of concept for connections. The falloposcope exits the left side, the handle is designed to be help upright in one hand, and the three fibers exit the right side where they are connectorized proximally. The distal sheath (right) is shown bending with a pull wire activated and straight in its neutral position. The scale bar is 2.5 cm. Fig. 6 Testing the falloposcope in a female reproductive tract model. A) The falloposcope passing through the working channel of a bronchoscope. B) The female reproductive tract model is shown with falloposcope (arrow) for scale. C) Frame from the bronchoscope’s camera of the falloposcope (arrow) entering the ostium, see Visualization 1. D) View from the falloposcope wide field imaging channel within the fallopian tube, illuminated with 638nm light. The arrow points to the dark section representing the lumen of the tube. The ostium inner diameter in this model is 2.5 mm. Fig. 7 Imaging porcine fallopian tube. A) Reflectance imaging of the lumen using the falloposcope and 638 nm illumination at 5 mm working distance. Scale bar is 0.5 mm B) Representative histology section (stained with Masson Trichrome) of fallopian tube showing muscle layer (M) and epithelial lumen (E). Scale bar is 0.5 mm. C) A longitudinal OCT scan of the mucosal side of fallopian tube covered with a coverslip. The image was taken with a motorized linear pullback scan of 4,000 A-scans/s over a longitudinal distance of 2 mm.